From time to time over the course of a campaign, players will embark in a new course well away from the story arc that you’ve planned. It is a product of role play and it is a large part of why role playing games are successful – they are adaptive and designed to work as guidelines rather than rules. Being able to leave the rails and to go boldly in a new direction is exactly why role playing games are the preferred game of many. Last night’s session was one such night, where the players decided to look much, much harder into one of the mysteries that they’d caught hints of earlier but had not acted upon. The town that they are based out of is plagued by all manners of woes, with recent years being times of great turmoil and strife. Having recently ascended to 5th level and having put an end to some of the woes, the players are starting to discern that a malignant force might be sowing the seeds of chaos. So rather than going the direction that they’d been nudged, they decided to look harder at their employers – the Council of Six, the ruling council of town. I’d already started thinking about a series of events and adventures for the church in town that had over the last three years lost more than half of its parishioners. So, adlibbing like mad, they spoke with a council member – a priestess – and at her bequest began looking into why her flock had become increasingly disloyal. The night became one primarily of role play and plot examination, with the players clearly seeing that the church of Cyric had been tempting, forcing, luring away the happy-go-lucky followers of Sune in great numbers and that the conversion had been transpiring for several years. It was starting to look as though the town might be like a rotten apple, bright and shiny on the outside but rotten with worms within. The players are forcing the growth of a new plot branch. Is there a lesson here, something to learn? Having considered a number of plot hooks and continuations, it was easy enough to reach out to one of half formed, half cooked plots and allow the party push off in a “new” direction. They are still working within the over-arcing plot, but the players are forcing the growth of a new plot branch. More importantly, this is the direction that they want to go. No longer trusting the direction of the suspect council, they want to examine things that had been otherwise ignored or kept hidden. They’ve uncovered several new leads and now have an array of paths that they might take. Keep your notes at hand and hold close your unimplemented or discarded ideas and plans as they might serve you well when the party sets off exploring an unexpected tangent or reopens a thread of thought only lightly touched upon. In this case, I really only had three semi-considered sub-plots and the one I chose was perhaps the least developed of them (another actually had battle maps and encounters built, albeit for a lower level group). Finally, if your plot has moving parts (and it should, if you can manage it), keep the timelines and background events moving. The players ignoring or electing not to follow breadcrumbs might later have unintended or dire consequences. 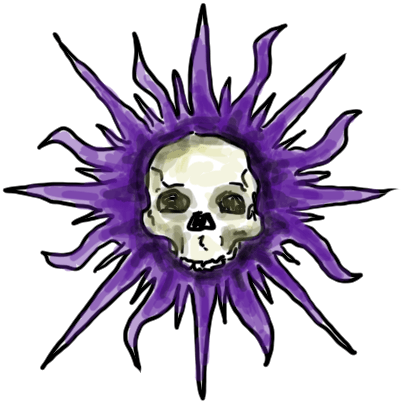 The sigil of Cyric was made with the Mischief software that I discussed earlier in the month. A handy tool for sketching!